Global climatic change is also likely to impact agriculture through shifts in patterns of pests and diseases (organisms that range from weeds, certain herbivorous insects, arthropods and nematodes to fungi, bacteria and viruses). Rising temperatures and variations in precipitation, humidity and other abiotic factors are affecting the diversity and responsiveness of agricultural pests and diseases across diverse geographic ranges (Rosenzweig and Liverman, 1992; Estay et al., 2009). Of all the factors that influence the productivity of agricultural pests and diseases, temperature is cited as the most important to insect ecology, epidemiology and distribution, while humidity and rainfall patterns and temperature are what define the responsiveness of plant pathogens (Coakley et al., 1999 cited in Hatfield et al., 2008). • active flight (migrant species). Climatic phenomena, ecosystem processes and human activities are interactive and interdependent, making long-term predictions extremely tenuous. Nevertheless, it appears prudent to prepare for the possibility of increases in the diversity and abundance of pest species in the context of climate change. To that effect, and to the dismay of economists and farmers alike, numerous citations note the abundance and frequency of pests and diseases as likely to increase as local climates are adjusted outside their previously bounded norms (Cannon, 1998; Stireman III et al., 2005; FAO, 2008; Gregory et al., 2009), especially in situations where crops are moved to previously unsuitable areas (Thomson et al., 2009). FAO (2008) cites Cannon (2008) who in a cursory report lists no less than 17 agricultural pests whose geographic coverage, species incidence and/ or intensity will threaten to bring about impacts on agricultural production under climate change. In a comprehensive report for the European Commission Directorate-General for Agriculture and Rural Development (2009), 16 different expert opinions are aggregated and prioritized to declare the 'medium' confidence level of likelihood that climate change effects in Europe are telltale signs of increased risk of pests, diseases and weeds (AEA Energy & Environment and Universidad de Politécnica de Madrid, 2007, Annex D). Tellingly, the same report lists the increased risk of agricultural pests, diseases and weeds in six of Europe's eight agroeco-systems as 'high' (the remaining two are listed at 'medium'). Under climate change, characterized by increased temperatures and CO2 levels, the fitness of plant herbivore pests is adjusting as their distributions and niches vary along with ambient conditions. In turn, their relationships with their natural enemies, phenologies (i.e. arrival and emergence times) and pressures from different pests and pathogens are noted in the scientific literature (Garrett et al., 2006; Ibáñez et al., 2006). The physiological changes in plants growing under new extremes and farmers' adjusted management strategies will largely determine how these dynamics play out (i.e. it is difficult to say with certainty which groups of contaminants will increase or decrease and on which crops). Numerous studies are finding that herbivorous insect outbreaks are expected to increase in both frequency and intensity as global climate varies. Using the results of inferential modelling, one study indicated that the increased distribution and abundance of Melanoplus sanguinipes, the migratory grasshopper, was linked to corresponding increases in temperature and moisture over stretches of grain-producing areas of Canada (Olfert and Weiss, 2006). The increases in area susceptible to this native insect pest under scenarios of temperature increases of +2, +4 and +6°C were 17.3, 28.2 and 42.2%, respectively, signifying a great loss in agricultural potential. Even among tropical species changes are being measured (Chen et al., 2009). The incidence of the coffee leafminer (Perileucoptera coffeella) and the nematode Meloidogyne incognita are likely to increase in future in Brazil's production area. The number of coffee leafminer cycles could increase by 4, 32 and 61% in 2020, 2050 and 2080, respectively, under SRES A2 scenarios (Ghini et al., 2008). This is more evidence to suggest that the range of many pest herbivores may expand as a result of decreases in cold stress. Indeed, the likelihood is that the limitations of many pest species to winter temperatures is being reduced (Newton et al., 2008). Diffenbaugh et al. (2008) determined the increased possibility of winter survival and greater degree-day accumulations for four insect pests in maize agroecosystems, including the corn earworm, a migratory predator of cotton, tomato and grains. They indicate that a relaxation in cold limitation would enable extension of the range of the pest taxa, while the increase in heat accumulation experience under warming regimes has the potential to alter pest management strategies across North America, harmfully impacting seed and pesticide inventory costs, yields and future effects in crop yield variability. Similarly, as warmer winters are realized the abundance of flea beetles (Chaetocnema pulicaria) (the vectors for Stewart's wilt (Erwinia stewartii) bacteria) will be likely to form a great threat to maize crops (Harrington et al., 2001, cited in Hatfield et al., 2008). While the impacts of pests on yields and productivity are undoubtedly affected by a multitude of factors that are both biotic and abiotic, effective and proven biological controls in the form of pests' natural predators are not to be overlooked as a factor that impacts agricultural potential. Thomson et al. (2009) address climate change effects on herbivores and parasitoids of crops and cultivars and how disruptions in climate factors are adjusting fitness and competition for their natural enemies. Direct and indirect aspects of phenological modifications in plants are affecting the fecundity and abundance of herbivores, disadvanta-ging their natural predators. Increases in ambient CO2 and temperature, and adjustments of humidity and precipitation rates are adjusting the availability of food resources for many pests, to their advantage and disadvantage, depending on the species involved. For example, both the larvae of the gypsy moth, Lymantria dispar, and the winter moth, Operophtera brumata, experience trouble with the change in food availability resulting from phenological changes to their food sources (Thomson et al., 2009), only there is evidence that the former can actually take advantage of elevated CO2 when choosing to deposit its eggs on oaks (Lindroth et al., 1993 cited in Cannon, 1998). There are also examples to the contrary. Cannon (2008, in Annex 1 of FAO, 2008) notes how the cotton bollworm, Helicoverpa armigera, scourge of the tropics, subtropics and southern Europe, has been increasingly seen moving inland since the late 1960s. In situations where bollworm dietary consumption of N is lacking (from an indirect effect of higher CO2 levels), the size of larvae was diminished, facilitating predators' chances (Coll and Hughes, 2008 cited in Thomson et al., 2009). Evidence from a study of caterpillar-parasitoid interactions across geographically dispersed ecosystems (Stireman III et al., 2005) suggests that there are limitations in the way specialized parasites will be able to track and regulate insect herbivore populations. This dynamic will be to the detriment of agricultural land with huge cumulative impact. The benefits to the development of natural pests and parasitoids of herbivores are many despite the low certainty of technical feasibility for success (AEA Energy & Environment and Universidad de Politécnica de Madrid, 2007). Among other things, they include a reduced risk of water contamination from pesticides (in systems that are projected to see less or more variable precipitation) and the fact that there are proven cases of enemies apt to transfer zones along with their prey (Thomson et al., 2009). Nevertheless, climate change effects on pests are complex and careful attention must be applied to manage the effectiveness of herbivore predators' role in moderating crop losses, especially as both cultivation and species' ranges (generally) expand (Thomson et al., 2009). As in the case of herbivorous pests, the reaction of agricultural diseases to climate change is specific to each strain and host in diverse geographical areas, but likewise poses itself as a real and intensifying threat. In explaining the variability of future impacts, FAO (2008) cites Chakraborty et al. (2000), saying 'Climate change could have positive, negative or no impact on individual plant diseases' due to the lack of comprehensive assessment (Gregory et al., 2009). Despite this, evidence suggests that wetter conditions will result in declining yields from disease problems while warmer conditions will enable the dispersal of disease-bearing insects and the increased survival of viruses (AEA Energy & Environment and Universidad de Politécnica de Madrid, 2007). The incidence of disease propagation also depends on the level of new agricultural intensification where the means for new pathogens to travel by way of irrigation canals, preferential flow and runoff will be enhanced. Furthermore, the significance of pathways for pathogens depends on the underlying geographical and geological properties (e.g. hydropho-bicity, solubility, volatility) (Boxall et al., 2009). 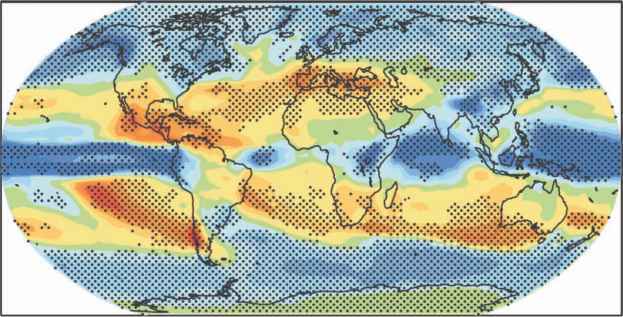 In reference to biotic changes, climate alterations may affect microclimates around plants resulting in increased risk of infection from wetness and root diameter (Garrett et al., 2006). Moreover, elevated levels of CO2 can bring about positive effects both indirectly (reduced expression of induced resistance in plants) (Pangga et al., 2004 cited in Gregory et al., 2009) and directly (pathogen growth and fecundity) (Chakraborty and Datta, 2003). The types of provisions needed to combat disease and viral risks to crops are complex. This is because rusts and viruses transmitted through insect vectors seem to be on the rise, while pathogens such as Rhynchosporium secalis that travel through water are less likely to be seen in the heat of summer under drier conditions. Wetter, less severe winters are not precluded from many regional equations, making general conclusions hard to come by (Newton et al., 2008). Climate modifications affecting diseases are also linked to food safety concerns. For example the propensity for the spread of foodborne pathogens from the greater temporal range of diseases during planting seasons has been noted (Ingram, 2008 cited in Gregory et al., 2009). Crop contamination from fungi similarly remains a threat. A report by the UK Department for Environment, Food and Rural Affairs (Defra) (2008) highlights the trend towards larger concentrations of microorganisms producing mycotoxins or aeroallergenic spores under higher temperature regimes. As in the cases of pests described above, a dual-edge sword would exist with increases in temperature and humidity resulting in the propagation of more fungal diseases on the one hand, while on the other some pests may benefit from a shift towards their optimum conditions, such as the case of the spruce budworm (Choristoneura fumiferana) (Fleming and Korpilahti, 1996 cited in Cannon, 1998), and away from those of their viral and parasitoid enemies. According to Fernandes et al. (2004), the risk of Fusarium head blight in wheat crops is very likely to increase under climate change in southern Brazil and in Uruguay. Further demonstrating the complexity of both plague and pest ecology are virus vectors such as whiteflies (Homoptera: Aleyrodidae) and the European large raspberry aphid, Amphorophora idaei. Bemisia tabaci is the most prolific of the whiteflies, carrying some 110 plant viruses, of which 90% belong to a genus that severely damages the plant physiology of its host (Morales, 2004). The European large raspberry aphid is a vector of four viruses: raspberry leaf spot virus, raspberry mottle virus, black raspberry necrosis virus and Rubus yellow net virus, that take as little as 2 min to be transmitted upon contact (McMenemy et al., 2009). Both pests will continue to enact large economic losses as climate change intensifies, especially given the diversification of suitable planting regions. Unfortunately, the expected increase and overuse of pesticides (Aydinalp and Cresser, 2008; Hatfield et al., 2008; Antle, 2009; Boxall et al., 2009; Thomson et al., 2009) to address the greater risk of agricultural pests poses detrimental effects to ecosystems. Pesticide use is already cited as being greater in warmer climates in the USA (Antle, 2009). Additionally treacherous is the prospect that increases in temperatures catalyse and augment the volatility and toxicity of pesticides jeopardizing regional atmospheric conditions, reducing their capacity on pests (Noyes et al., 2009) and further necessitating their overuse.